Winter photo shoots can be the most fun of all! They can also be incredibly challenging. For one thing, it is really cold and most of us don't like the cold too much. It can be windy, snowing, blowing, hailing, and the walk to wherever we want to go can be quite challenging without a good pair of snow shoes. However hidden in the far off places in the winter there are some real gems. This one for instance behind Indian Falls which has been completely frozen in the -20 degree temperature is one of those gems. 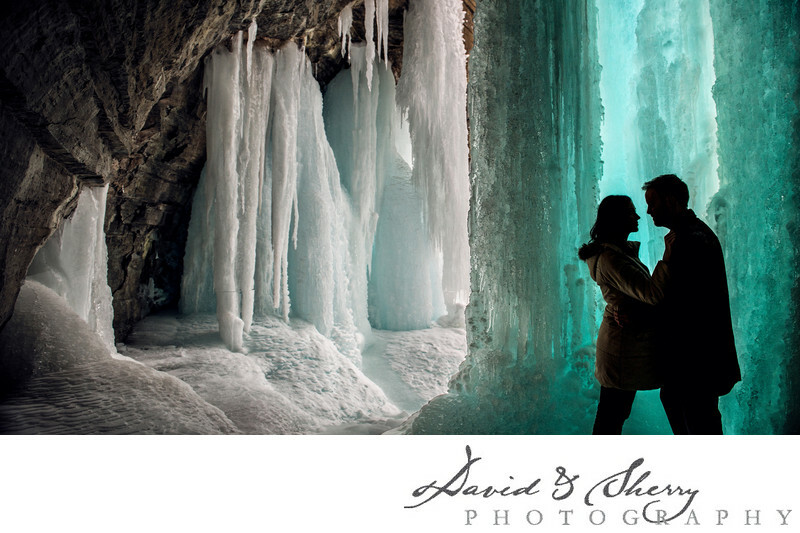 We hiked back to this wonder of a place during an engagement shoot and it was cold enough where the icicles were not falling from the sky wanting to impale us so we trekked up a makeshift ice ladder and made our way behind the falls. There we took some silhouetted pictures against the deep blue of the frozen falls. I love the composition of this particular photograph as it depicts the love between two soon to be married people but also looks like it happened in a far off land or somewhere that doesn't belong on earth. We love winter photo shoots in Owen Sound and exploring all that the Bruce and winter have to offer.